Throughout the years of competitive Dota 2, heroes have waxed and waned in relevance as the metagame changed. But a select few have held a significance to the game far beyond just one or two metas. 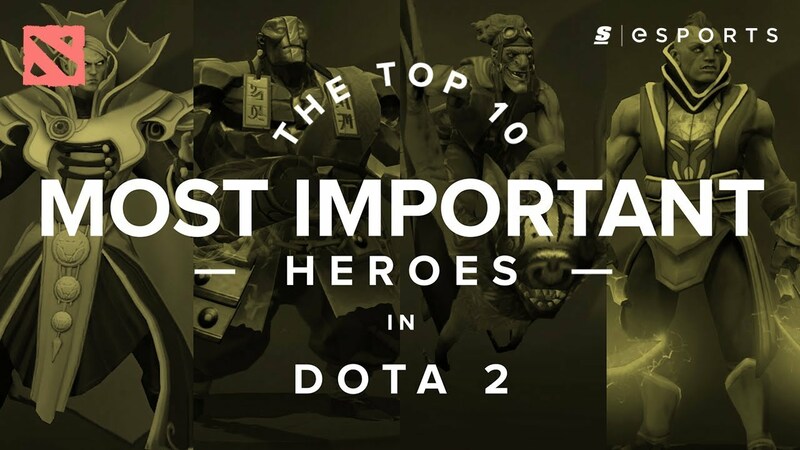 In honor of those meta-defying heroes, we're counting down the Top 10 Most Important Heroes in Dota 2 History. Meta Significance: Did this hero hold importance to various metas, and/or shape multiple metas around themselves? Consideration given to pick/ban rates all time and at The Internationals. Role Significance: Did this hero define how one or multiple roles were/are played historically? Did the hero change or empower a given role in a new way, or change the way the role is thought about? Longevity: Was this hero relevant for a long period of time or for multiple years across Dota 2's history? Career Significance and Other Factors: Some weight given to the significance of a given hero in defining the careers of professional players and the way the professional scene of Dota 2 is perceived or has developed. Note: All statistics are as of Nov. 20, 2017. As the all-time most picked hero in competitive play, Rubick has been a staple of the pro scene since his release. He offers excellent ganking potential and the ability to change games with a single well-executed Spell Steal. Rubick has become the signature hero of countless players and has been a key element in some of Dota 2’s most famous and dramatic moments. The presence of a skilled Rubick player in any match makes opponents think twice about throwing out their big spells and can change the course of a game in the blink of an eye. Players love playing him and fans love watching him — what more could you ask for? Other Notable Statistics: Among the top 12 most contested heroes at six of the last seven TIs, fifth most contested pick all time. Since the very start of Dota 2, Anti-Mage has been one of the gold standards for carry heroes and has defined the careers of countless pros such as BurNing. This is especially true for Dota 2’s first year: Anti-Mage was the most banned and the 10th most picked hero at TI1. However, regardless of meta, when Anti-Mage is popular, he is a force to be reckoned with. It comes down to this — for the past eight years, the ability to play Anti-Mage well has been one of the bars by which all position one players are judged. He has been, and will continue to be, a defining hero for carry players as long as Dota is played. While he may only have been added to Captain’s Mode in December 2015, Earth Spirit has become an essential part of the competitive meta. His ridiculous long-range ganking and ability to roam easily and effectively empowered Position 4 players, allowing players such as JerAx to build their reputations on the hero. At TI6, Earth Spirit was picked or banned in half of all games and today he's the 45th most contested hero of all time, ahead of much older staples like Night Stalker (50th), Magnus (55th) and Dragon Knight (64th). Earth Spirit changed the way teams think about pick-ban and forever changed the roaming four role, and that’s why he comes in at number eight. Shadow Fiend has traditionally done for Position 2 players what Anti-Mage has done for carry players: becoming the bar by which their ability is judged, and therefore gaining a significance far beyond the numbers. Shadow Fiend is a signature hero of countless players like Ferrari_430, Arteezy and Mushi, and has a legacy as the de facto hero for 1v1s. While other picks such as Queen of Pain or Puck have filled similar roles, neither have the same sort of history or mystique about them. Shadow Fiend was most popular in the first three years of Dota 2, but players like Arteezy did, for a time, revolutionize SF as a stable safe-lane pick, giving the hero an added significance. Look at it this way: when players face off against the Open AI, what hero do they play? Shadow Fiend, of course! That alone should indicate how important SF is to the competitive scene of Dota 2. In many ways, Invoker is to the new generation of players what Shadow Fiend was to the old — a hero on which they can measure their skill and prove their immense mechanical talent. While Invoker isn’t meta-defining, he’s absolutely game-changing. The game-to-game impact and longevity of Invoker is what makes the hero so important to the history of the scene. Thanks to Invoker’s flexibility in skill builds and item build, he has rarely, if ever, fallen out of meta. Finally, as the fourth most contested hero of all time (37%), Invoker is always relevant, exerts a tremendous amount of pick-ban pressure and must be dealt with in any game in which he is picked. Chen was the Earth Spirit of his day, defining what it meant to play Position 4 from around 2011 to 2013. While his popularity since then has gone up and down, Chen was a meta-shaping support pick during the first three years of Dota 2. His ganking threat and ability to push towers early was make-or-break for certain strategies during that time period, and he was a signature hero in the careers of many of the best supports of that era, including Puppey, ChuaN and Akke. Very few heroes in the early days of Dota 2 had such a widespread and dramatic impact across the board, but Chen was one of them. But what makes Chen truly stand out is that he has the all-time highest win rate of any hero (57%), going to show just how impactful he can be in the right hands. Note: Since time of writing, Chen was surpassed in win rate by Pangolier (67%). However, Chen has 1852 competitive wins while Pangolier only has 4. No matter the meta for the offlane, Dark Seer has found a home, lending his terrifying teamfighting to just about any composition. He was a premier pick back when the offlane was a deathtrap and even as the offlane meta gradually became more stable, Dark Seer made the transition where others failed. While he’s had periods where he’s fallen out of favor, they tend to be short, and when he’s in, he’s in. Dark Seer has been the hero against which all other offlaners are judged for the better part of seven years. Basically, every offlaner of note who has ever played Dota 2 probably has a Dark Seer in their arsenal, whether they like it or not — the pick is that important to the history of the offlane role. Other Notable Statistics: 4th most picked hero all time, 3rd most contested hero all time, 3rd most banned hero all time, Top 12 most contested hero at five of the last seven TIs. Ever since the game’s beginning, Nature’s Prophet has been single-handedly winning games, and a good Prophet player shapes the game around themselves. Prophet is a hero that has rarely, if ever, fallen out of favor. No matter the meta, Prophet has found room in the offlane, the jungle, safelane or even the mid lane. He’s flexible, rewards strong map play and team coordination and is a win condition unto himself. His relevance has stretched across years, and he’s the 9th most picked and 9th most contested hero of all time. Batrider has almost always been relevant in one form or another, especially since 2013. Offering initiation, disables, strong laning and solid damage, Batrider fills in nearly every gap a team could ask for. While he was initially played mid, he has found homes in the safe lane, the offlane and even occasionally support. Batrider has been a top pick in nearly every meta for the past five years and is the most contested hero ever by more than 3,000 picks and bans, making him the most statistically significant hero of the lot. Other Notable Statistics: 3rd most picked hero all time, most banned hero all time, 99% contested rate at TI3. Io shapes entire games and entire metas around itself, and has done so for nearly five years. Any game in which it is picked takes on a completely different complexion thanks to its global presence, team sustain and catch potential. Io forces opponents to think differently about their strategy while giving the friendly team nearly every conceivable advantage, and as such Io has never really fallen out of favor despite years of meta shifts, nerfs and gameplay changes. While Io’s most prominent time was The International 2013, where it was famously abused by Alliance to win it all, Io has been in the top 12 most contested heroes at four of the last five Internationals, a testament to the hero’s longevity. Whether you love or hate Io, its statistical significance and its impact on how competitive teams approach each and every game cannot be understated — Io is the most important hero in Dota 2 history. Other Notable Statistics: Second most contested hero all time, second most banner hero all time, 9th highest win rate of all time.